THE SERIES SPPM SMART PROGRAMMABLE PANEL METER is a configurable full-color touch-screen display that can be used in a variety of applications. By using a USB connection, the panel meter can be configured with downloadable software for any computer running Windows® based software. 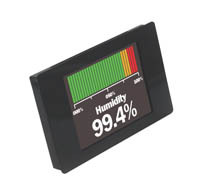 The display features remarkable graphics that can easily be customized to read and/or graph pressure, temperature, humidity, gas concentration, or many other parameters. See the Series SPPM2 for full configurable touchscreen capability. Current: 0 to 50 mA, scalable (factory set from 4 to 20 mA); Voltage: 0 to 40 VDC, scalable (factory set from 0 to 10 V). 0.3 to 9.8 mV (depending on input range). 4-30 VDC max or via USB. 2.4", 2.8" or 3.5" TFT full color screen. 32 to 104°F (0 to 40°C). Screw terminals, pin connection, or USB. Compatible with Windows® 7, Windows® 8 and Windows® 10. K-type: -328 to 2462°F (-200 to 1350°C); J-type: -328 to 2174°F (-200 to 1190°C); T-type: -328 to 734°F (-200 to 390°C). Powered by USB port through SPPM panel meter.